John Philip Sousa, America's "March King"
John Philip Sousa was an American entertainer and composer. He is best remembered for his marches, his band, and his patriotism. Known as the "March King," he wrote 136 marches, including The Stars and Stripes Forever, the national march of the United States. (If you go to the "Jammin' Jukebox" in the See, Hear & Sing" section, you can listen to it.) He also wrote many other musical pieces, including operettas, popular songs, waltzes and more, as well as seven books and many articles. He first became famous while serving as the leader of the U.S. Marine Band. Later he formed his own band, the Sousa Band, which toured for 39 years and entertained millions of people. 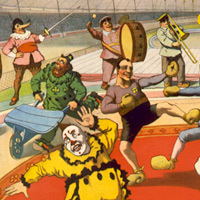 How would you like to join the circus? "The Circus or the Marine Corps?"